The new logo…bask in all it’s cryptic glory. It looks like there was an upgrade in Okabe’s cellphone plan since he’s gone from a cellphone to a smartphone in the newest Steins;Gate game. There has been a new video for the upcoming sequel Steins;Gate 0. Featured is the new “RINE Trigger system”. Instead of the d-mail system like in the first visual novel — where you got occasional e-mails from your friends at story moments to affect the plot progression — you will now get text messages in real time through the RINE app on Okabe’s phone, which you’ll be able to respond to while playing through the story. Phones played a key part in the first Steins;Gate and dated the game in a good way, making it clear that the game took place in a particular point in time of the late 2000s. The switch to a smartphone and using an app seems to be taking that same key function to make it recognizable as a sequel to Steins;Gate while still bringing a significant change to the mechanics of the game. 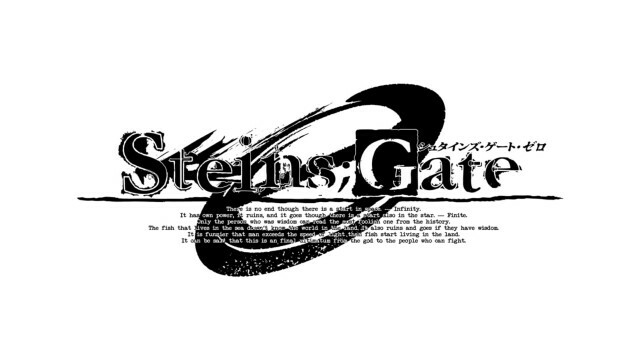 Steins:Gate 0 comes out in Japan for PS4, PS3, and PS Vita on December 10. We have yet to receive news of a western release, but considering the success of the anime and first visual novel, it isn’t too unlikely that a western release could follow. Jerry Hrechka is a writer and journalist. He was born in the Catskill mountains and now resides in Georgia, still trying to work out how exactly that happened. His work can also be found on nerdstock.com as well as on his horror podcast 1001 Frights.